How Competent is Your Silica Competent Person? It’s a key part for OSHA Construction Silica compliance to ensure you have a competent person on site, but you may be wondering what it takes to be a competent person as required by the new standard. ST. PAUL, Minn. — The Occupational Safety and Health Administration (OSHA) defines a competent person as an individual who is capable of identifying existing and foreseeable respirable crystalline silica hazards in the workplace. This person must also have the authorization to take prompt corrective measures to eliminate or minimize these hazards. The competent person must have the knowledge and ability necessary to fulfill the responsibilities set forth in 29 CFR 1926.1153(g). The competent person on site plays a key role in ensuring compliance and engaging your workforce to work in line with the spirit of the regulation. Though a formal training course may not be directly called out in the standard, training is a way to benchmark competency for whomever you have designated as a silica competent person. Training provides a safe environment to help answer lingering questions or implementation challenges. What Are Key Aspects to Train Someone to be a Silica Competent Person for a Worksite? Many companies often believe that all competent person tasks have to be assigned to one superintendent, lead foreman, or senior worker by default for a job site. However, an employer should choose the most suitable person or persons at each job site to serve as the OSHA competent person for each regulation that requires one. For instance, for each jobsite you can have a competent person to oversee a different regulation whether it be silica or something else. You can even have multiple competent persons for a single regulation to provide overlap, particularly for larger job sites, when there is a need to cover multiple shifts. This can be particularly helpful when there is a need for timely coordination with other trades, to increase support at the start of a new project, and to oversee heavy use of regulated materials. 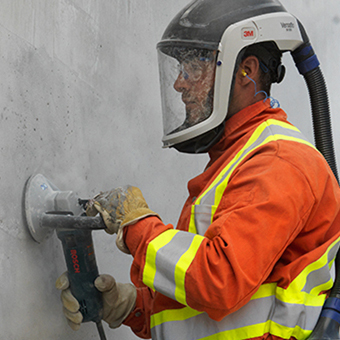 While the new silica regulation does not precisely define requirement for “frequent and regular inspections of job sites,” the competent person should be someone who is consistently on the work site with the crew. They should be in a position to move around and observe tasks that involve exposure to respirable crystalline silica during the work shift. It is essential that the silica competent person assigned to the task should understand the work materials, equipment, and processes. The knowledge and skill of a competent person will not be equivalent to that of a trained safety professional; however, the competent person should be able to assist with hazard assessments, monitoring, and designing controls, processes and procedures that will help protect workers. When making the decision to seek out training for a silica competent person, you should partner with a provider who can help educate you about the right PPE choices for silica as well as provide ongoing training/support. You should work with a company that helps keep you up to date about new technologies, regulatory changes, and other important developments. Contact our Technical Service specialists to help get information in these areas and stay up to date with the latest in 3M PPE choices. If your crew works with silica, you've probably heard about OSHA's updated construction regulation that goes into effect starting mid-2017.